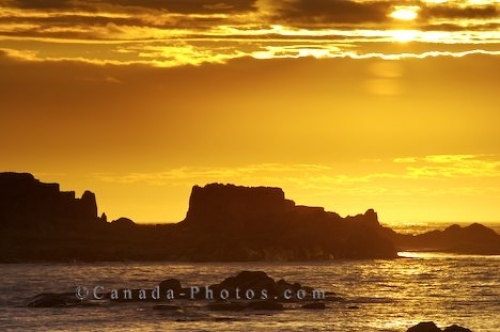 Along the northernmost tip of Newfoundland in Newfoundland Labrador, Canada is where the town of L'Anse aux Meadows is situated showing off its spectacular sunsets. This sunset highlights the sky in a glowing yellow color as the rocky island just off the shore from the town becomes silhouetted as the ocean waves crash around it. Not only is each sunset stunning to watch from coastal shores of L'Anse aux Meadows, but the town is home to the first authentic Norse village, the only one in North America outside of Greenland. Picture of a glowing sunset in bright yellow hues over the rocky coastline near the town of L'Anse aux Meadows, Newfoundland.